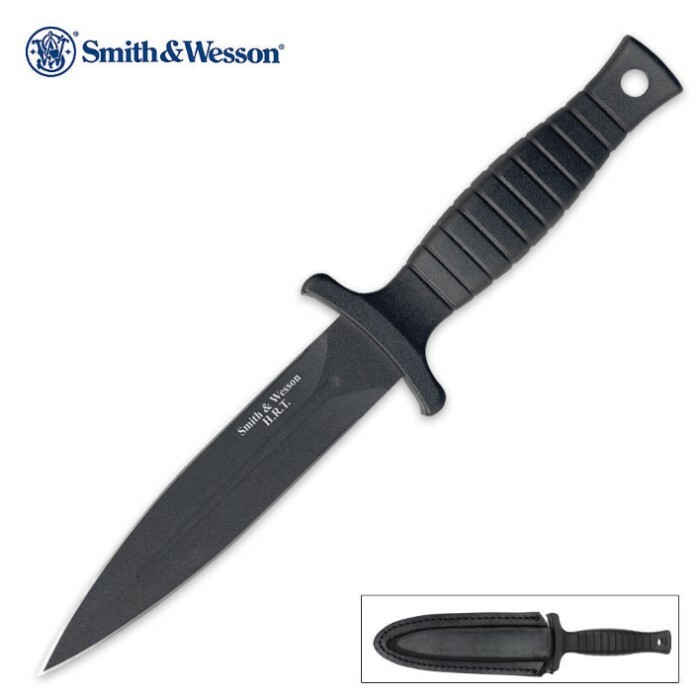 This heavy-duty boot knife is built to last with a 440 stainless steel, black Teflon coated, 4 7/8" blade. The handle is constructed of solid aluminum cast metal with non-slip grooves. 9" overall. For over 150 years, Smith & Wesson has been one of the most trusted names in self defense. When you need a dependable tactical knife, you can trust the signature series of the nation"s largest manufacturer of handguns. Smith & Wesson used decades of knowledge and resources to develop knives that are reliable in a wide range of situations. Whether you are a Smith & Wesson collector, law enforcement official, or simply looking for a high quality knife, Smith & Wesson makes the perfect knife for your needs. This is a great knife. I would highly recommend this to anybody. The sheath is real leather. I bought this knife some time ago and it is a nice knife but I think there's some sort of confusion going on in shipping. The one I ordered was the SWHRT9B and the picture showed an all metal handle with a large hole for a lanyard and what I got was the rubber coated handle with a sm. lanyard hole with a grass insert in the hole like the same looking knife SWHRT9BF but was marked SWHRT9B on the blade. I thought there was some mistake and I decided to keep the knife and just order another one and it was the same rubber handled one like the first . So now I have 2 of the same knife. I do like them but really wanted the solid metal handle. WARNING!!! this comes very sharp. i got this and another knife. the other knife got jammed(spring assist) so i used this to get inbetween and unjam it and i pushed it right through and cut a 1/4 inch deep half inch long cut on my 3/4 inch thick finger. IT'S SHARP!!! First off..... wow. Im sooo impressed with this knife and the price is outstanding. And the knife fits so snugly in the leather sheth. Plus the sheth has a snap to hold the knife in place and that works great. I put the snap on and tried to pull the knife out with all my force and it would not budge one bit. It came almost razor sharp and verry pointy. The only flaw is that the handle is slightly small but then again it is a boot knife so it needs to be small. So deffinate 5 in my book. Very nice knife, came very sharp, well worth buying. this is the sharpest blade i own. the sheath is awesome. love it. Very good knife. Solid construction, fits perfectly in sheath. It is little on the light side, and the handle could be bigger (then again I have huge hands) though. Either way, it's very sharp. Well worth the $18. This is an Excelent knife, its very strong and stays resonably sharp even after a heavy work load. Currently my favorite work knife.